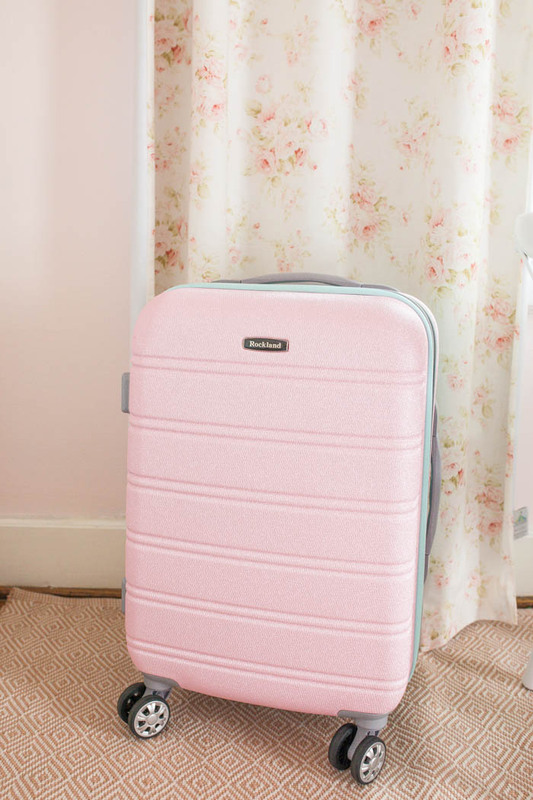 I feel like I had scoured the internet for the perfect subtle pink suitcase for Scarlett for her first flight! I knew we would be fine with getting her a carry on size so that helped keep some options open for me. I finally found the perfect one that was at a great price point! At the time I ordered it, the carry on was just $53, but it looks like the price has increased since. Maybe because so many of y’all bought it from my instagram shares. I have been really happy with the suitcase! It was so easy for her to use during our flight. and she rolled it with ease! I love that it has the spinner wheels, so she could walk with it upright or could roll it on an incline. You never know what you will need in certain airports! The subtle pink and great price is what made be pull the trigger on this one! I love how it has a mint backside too, that added some fun to it! I really wanted to invest in something that could last her several years. 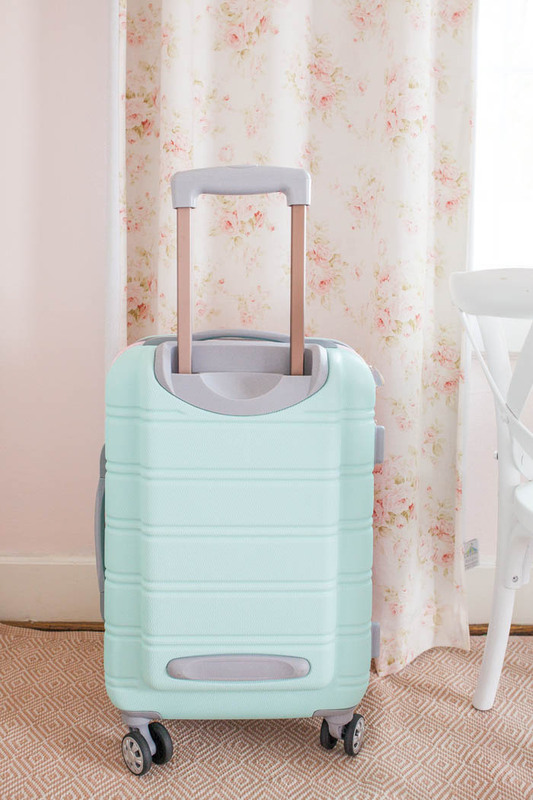 As much as she probably would have loved something with a pattern or brighter colors; I am just wanting this to last awhile because I did not enjoy looking for suitcases online if I’m being honest. As you can see, it is also expandable which is nice if you need to pack it fully for extended trips. We packed hers for 7 days and still did not need to unzip the expandable part. It is very roomy! The cubes were a spontaneous last minute amazon order that I am SO GLAD I thought of! For a 5 yr old who is so excited and constantly looking through her suitcase everyday, this was lifesaving for keeping things still really organized during our travels. I thought they would been the most helpful during packing, but really I appreciated it more when we got to our resort. We then packed up again and headed to the Tucker’s home, so it was like nothing to throw her stuff back in and zip it up for the next stay. I love the clip on the right side of the carry on, that was really nice to keep everything I packed in place once I loaded it up. Photos were taken after we got home, so it was a little more packed than this. I also love the privacy zip on the left side. That was helpful in keeping things in place– which if you are packing a young child… you know they need several random things, so I really liked this feature. Overall I am so pleased with this suitcase! It fit all our needs for our trip and was just what we needed for packing a small child. 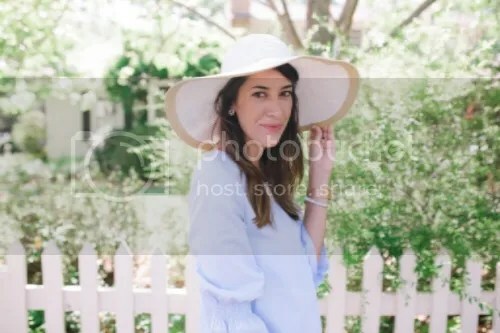 * pricing could change deepening on when you read this post, but hopefully this helps! 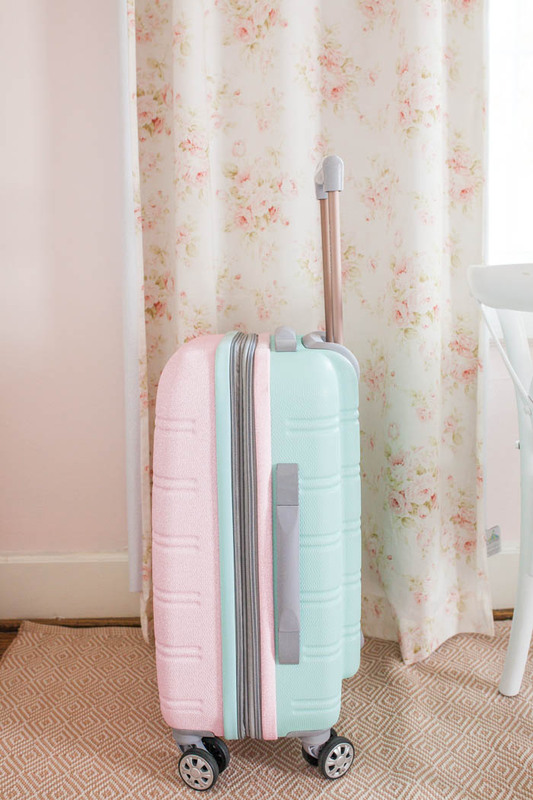 And if you are looking for the perfect pink suitcase, too, I’ve rounded up a few others that I had my eye on during my search!